Newton Hotel is ideally situated to many local attractions from shopping centres to museums and theatres. You will find the following attractions listed below within close proximity to the hotel. Please click on the attraction name for more information. Recently refurbished and always popular housing a number of regular malls and shops. This centre is also surrounded by many shops situated on Sauchiehall St. The premier quality shopping centre, providing residents and visitors with an unequalled shopping experience. Positioned at the junction of Glasgow’s famous Sauchiehall and Buchanan Streets. Enjoy a quality shopping and eating experience by day, and by night, explore exclusive cocktail bars and restaurants open till late. Europe's largest glass structure. Prides itself on being a fun, family and most of all friendly shopping centre, catering for all age groups and shopping tastes. Offering the largest selection of diamond rings, diamond jewellery, wedding rings and watches in a single location in Scotland. Situated in the fashionable Merchant City district, the Italian Centre is one of the best places to find designer clothing in Glasgow. Now refurbished and home to various bars, cafes and restaurants, Merchant Square benefits from a central location close to some of the most exclusive retail shops in Glasgow. A historic marketplace that's sure to surprise! An eclectic mix of covered and open stalls selling a huge range of goods from antique furniture to computer games. Glasgow's most historic and well known theatre. Glasgow's' award winning family theatre. Formed by local people and working with local people. Scotland’s premier music venue offering the very best in classical, world music and popular entertainment. The Glasgow Royal Concert Hall also produces the world famous Celtic Connections Festival every January. Exceptional arts venue with a programme of relentlessly stimulating events, performances and exhibitions, including the annual Beck's Futures show each summer. Built in 1856, the Galleries are named after their builder, Archibald McLellan. Following his death, Glasgow City Corporation bought the building, and it was used as an exhibition space. Scotland's largest private gallery, occupying five floors of an early 19th century building in the heart of Glasgow. GoMA is the second most visited contemporary art gallery outside London, offering a thought-provoking programme of temporary exhibitions and workshops. Charles Rennie Mackintosh's greatest architectural achievement. Still a working art school, guided tours take visitors through the corridors of the building and finishing in one of Mackintosh's most celebrated interiors, the Mackintosh library. This is Scotland’s first dedicated, national centre for architecture and design. Queen Elizabeth opened this house in July 1999. It also contains the award winning Mackintosh Centre and Mackintosh Tower with stunning city views, Vitra Conference Suite, form: The Lighthouse Shop and the doocot our stylish rooftop café/bar. Kelvingrove Art Gallery and Museum is reputed to be one of the finest civic collections in Europe, and is located within a popular landmark in the West End of Glasgow. One of the most elegant buildings in Glasgows city centre, Hutchesons Hall was built in 1802-5 to a design by David Hamilton. It incorporates on its frontage the statues, from an earlier building of 1641, of the founders of Hutchesons Hospital, George and Thomas Hutcheson. In the very heart of Glasgow stands one of the city’s most important and prestigious buildings – the City Chambers. Daily tours are also avalable. 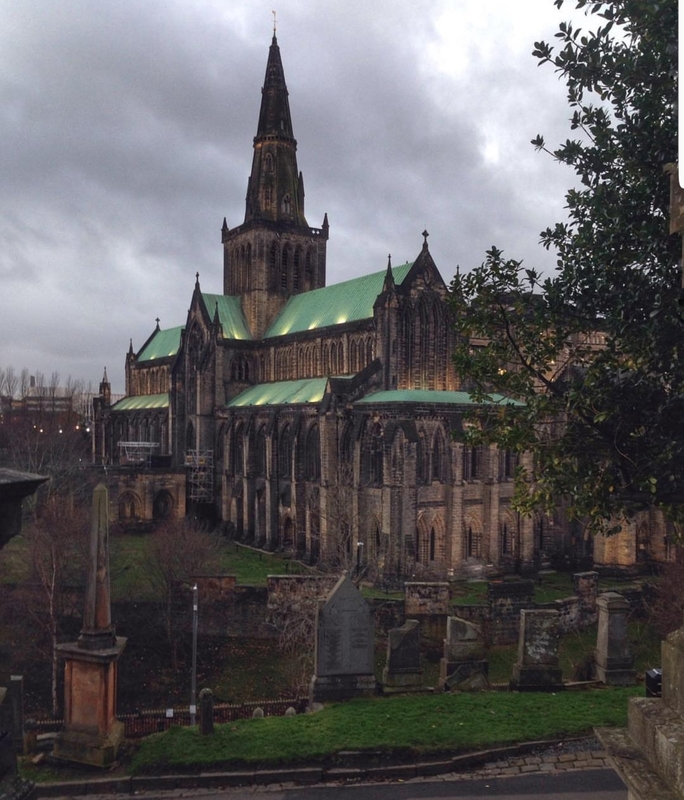 Glasgow Cathedral is truly magnificent, full of beauty and wonder. It is the first stone-built Cathedral that was dedicated in the presence of King David in 1136. The Necropolis stands on a hill to the east of Glasgow Cathedral, just a short walk across the Bridge of Sighs. The monument to John Knox, which was erected in 1825, dominates the hill. The Mitchell Library is the hub of a citywide information service. In addition to accessing reference material, customers can borrow selected material from the Mitchell’s collections. SECC is Scotland's national venue for public events. It's also the UK's largest integrated exhibition and conference centre: a world class facility set in one of Europe's most vibrant cities.